This particular strain of Dodder is Cuscuta campestris and it is originally from North America. Dodder is a parasitic plant and it is yellow because it lacks chlorophyll and is thus unable to make its own food so after germination, it needs to attach itself to a host plant or it will die. Unsurprisingly, this vine-like plant is a member of the Morning Glory family, Convolvulaceae, a family that has many invasive members. 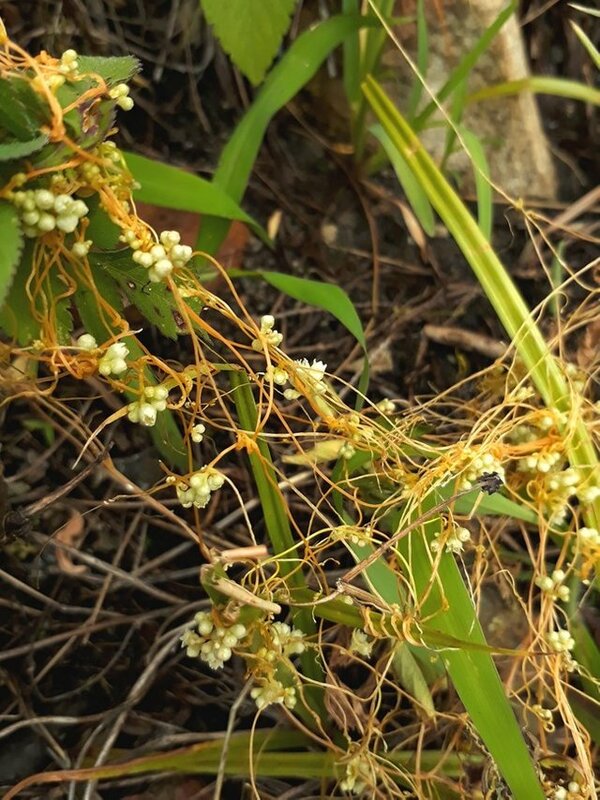 Dodder is a serious pest of agricultural crops because it kills the host plants and seeds remain viable in the soil for very long periods and are capable of surviving soil sterilisation methods such as solarisation. I find it interesting that Dodder does not colonise grasses and so it is only found on the hill where there are dense patches of plants. These dense patches are made up of other invasive plants and that gets my inner mad scientist thinking: what if dodder could be used as a form of biological control of other invasive species? The problem I can see would be that there would be even more Dodder seeds spread in the environment although when it comes to invasives such as Mirabilis japonica (4 o'clock plant) and Lantana these outcompete all the natural vegetation anyway and the only option is herbicide or manual removal. Manual removal isn't really feasible in the rocky environment and I'd prefer not to go nuclear with pesticides so I think an experimental sowing of dodder seeds in a lantana patch definitely is worth a try. I'll report on the progress of the experiment in due course. Such beautiful plants as beads, but in fact it is a predator. These are like spider web! Spreading everywhere! Yes. Do you get them in Thailand? weeds are truly annoying. For us lantana is the worst.